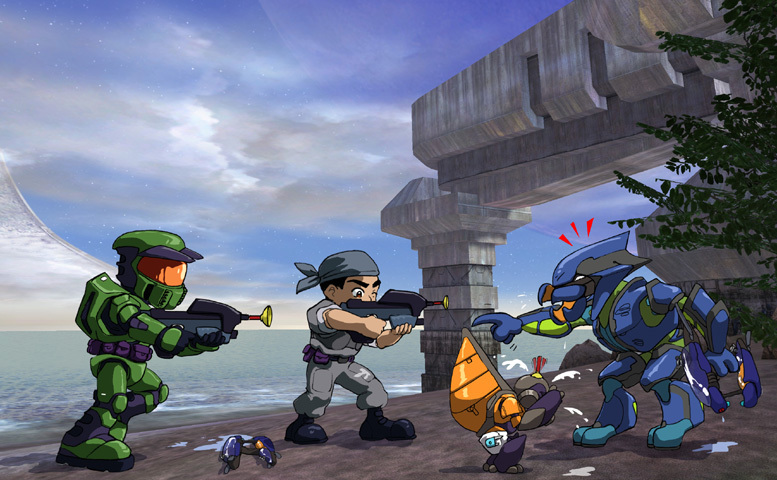 Halo Babies is a delightful non-violent animated children's show based upon the game Halo: Combat Evolved by Bungie Studios. The 24 episodes in three seasons originally aired from January 5th, 2002 to October 26th, 2002 at 10 AM EST on Fox Kids. Each episode was 30 minutes long in high definition stereo (where available) with closed captioning. The series is currently in syndication. There is no word yet as to whether there will be additional episodes or when the series DVD will be made available. It could be said that the seeds of Halo Babies were first planted when Bungie was shopping for animators to do cutscenes for the Myth series. According to sources inside Bungie, the story goes like this: while Bungie was delighted with the work Canuck Creations did for Myth: The Fallen Lords, they were very expensive. The animation for Myth II: Soulblighter by the Anime International Company was reasonably priced, unfortunately, it was also drab. Bungie was at an impasse as to who they should choose to do the cutscenes for Myth: The Fallen and They Can't Get Up Lords when Alexander Serpoian accidentally tripped over Tsing-Tao Kirin throwing up behind a seedy bar in Chicago. When Alex found out that Tsing-Tao was a fledgling animator and master sock puppeteer, he invited him to submit a sample of his work for the new Myth title. Tsing-Tao sent Bungie a 5 minute movie that was hilarious in its awfulness - Tsing-Tao had managed to make the Myth characters look like blind epileptic babies. Thus the idea was firmly planted in Bungie's collective mind. One of the most irritating misconceptions about Halo Babies was the exact order of the episodes. Bungie's own article about Halo Babies has significant errors in it which casual observers took as gospel. This confusion was further exacerbated in the third season because the episode "Real Marines Don't Cry" (HB308) was created as a filler and the exact date of its airing could have been anywhere from September 7, 2002, to October 26, 2002, depending upon the whims of the local Fox affiliate. The pilot, "Sundae School" (HB001), was totally created in-house at Bungie as a 'proof of concept' piece for Microsoft's Franchise and Licencing division. They did such a good job that it was immediately used to test market the series in the Seattle area. The hour-long pilot aired on KCPQ-TV on Sunday, November 24, 2001 at 2:00 PM PST. It was an unqualified sucess. Based upon the reaction of the test market, Microsoft and Fox immediately signed a three year deal and the series immediately went into production. While the pilot was a part of the franchise package, many Fox affiliates have never shown it. The plot of the pilot was recycled and substantially improved upon in "Dressed to Kill" (HB106). The skull briefly seen in "All's Fair..." (HB104) was rumored to be a representation of the mortal remains of Bungie's Disembodied Soul. Bungie has vigorously denied this. The episode "Hippy Potty Masses" (HB107) is the first episode where John is referred to as the Master Chief. There was never an in-story explanation for the change. Cortana was originally written to be a daring, sarcastic sidekick for the Master Chief in season two. The creators did a dramatic about-face when they realized there would be a void in the adult supporting cast with the absence of Aunt Halsey and Uncle Mendoza, so Cortana was changed to be more of a stern older sister type character. Also, with the loss of the Spartan Babies, the Marine Babies were featured much more prominently in season two until the wildly popular Flood Babies were introduced. The tremendously cute and cuddly Flood Spore Babies (nicknamed "Flublies" by the animators) were introduced in "You Tickle My Funnybone" (HB303) and the series registered a significant jump in the ratings. Rumors abounded that Bungie was going to approve a breakfast cereal named Flubly Pops, but the deal fell through when certain liability issues were discovered. The initial franchise for Halo Babies only specified three seasons, however, the possibility of a sequel was left open - if you look carefully at the end of "Halo Goodbye" (HB307), you will notice that one of the sparkly pieces of Halo looks like Twee For Twee Giddy Spank. As mentioned previously, "Real Marines Don't Cry" (HB308) was created as a filler and may appear anywhere in the actual broadcast lineup. Season One - "Reach Out and Touch Someone"
HB101 - "Strangers with Microchip Cookies"
HB102 - "A Mendoozy of a Mistake"
HB103 - "What's Up Doc?" HB106 - "Dressed to Kill"
HB107 - "Hippy Potty Masses"
HB108 - "The Ghost in the Diaper"
Season Two - "Halo, It's Me"
HB201 - "No Time! Like the Present?" HB202 - "Look Before You Leap"
HB203 - "Ooops, I Said it Again"
HB204 - "The Big Wheel"
HB205 - "Don't Look Down"
HB207 - "Little Cyborg, Big Heart"
HB208 - "The Silent Cart Ossifer"
Season Three - "You Say Goodbye, I Say Halo"
HB301 - "The Big One that Got Away"
HB302 - "Scratching an Itch"
HB303 - "You Tickle My Funnybone"
HB304 - "Truth... and Reconciliation"
HB305 - "Bang Sheep in the Sky with Dimes On"
HB306 - "My Grandpa is Swelled"
HB308 - "Real Marines Don't Cry"
HB001 - "Sundae School" - Aunt Halsey dresses the Spartan Babies in their best diapers for their first trip to Sunday School. As she describes what Sunday School is about, John, Kelly, and Sam come to the mistaken impression that they are going to an ice cream parlor. On their way to church they encounter the Covenant Babies on the way to their church across the street. Faster than you can say, "Nobody expects the Spanish Inquisition," half the Spartan Babies are going to the wrong church - lured by the Covenant Babies promises of "blissful assimilation." John, Kelly, and Sam rally the wayward Spartan Babies by telling them that ice cream with sprinkles awaited them in their church. However, when they finally arrive at Sunday School instead of ice cream they get stern lectures about eternal damnation. HB101 - "Strangers with Microchip Cookies" - In the introductory episode, we meet John, who is lured from his school playground by two mysterious strangers. All's well that ends well when the two strangers turn out to be Aunt Halsey and Grandpa Keyes. At Aunt Halsey's house, John makes new friends with the Spartan Babies after learning that teamwork makes you stronger. HB102 - "A Mendoozy of a Mistake" - Uncle Mendoza takes the Spartan Babies on a camping trip. Announcing that he "knows these woods like the back of his own claw," he tears up his map. Much hilariousness ensues when he promptly becomes lost. John and Kelly save the day when they tape the map back together and flag down a passing dropship. HB103 - "What's Up Doc?" - The Spartan Babies become sick but hide their illness for fear of "the crew-ell Doctor Jeromi". Fighting dysentery, the kids explain their condition by claiming that they had visited a chocolate factory. Feverish and leaking, the babies lead Dr. Jeromi and Nurse Wratchett on a wild goose-chase around the hospital. This wacky situation is resolved when they are captured and treated. It turns out that visiting the doctor isn't that bad, especially when you get ice cream and neat-o printed circuit skull tattoos. HB104 - "All's Fair..." - The Spartan Babies run afoul of some neighborhood bullies: the Jello Lumpers. John courageously stands up to the bullies. The standoff is resolved when Aunt Halsey suggests they divide up into teams and play Oddball. Of course, the Spartan Babies win the game. HB105 - "They're Everywhere!" - During a trip to the liquor store, Grandpa Keyes accidentally backs his frigate into an alien space ship. While Grandpa Keyes argues with the alien pilot, the Spartan Babies wander away only to run into the Covenant Babies. Mistrust abounds until it is discovered that all of them like to play with guns and explosives. The Spartan Babies learn that babies come in all shapes and sizes and that it's great to make new friends. HB106 - "Dressed to Kill" - Aunt Halsey buys the Spartan Babies sparkling new armored bodysuit diapers and strongly cautions them not to get dirty. The Spartan Babies immediately wander out to the Sigma Octanus playground where they run into the Covenant Babies. The Covenant Babies taunt them until John, Kelly, and Sam chase them through a mud puddle. The Spartan Babies blame the Covenant Babies for the mess, but Aunt Halsey teaches them the importance of restraint and clean underwear. HB107 - "Hippy Potty Masses" - The Jello Lumpers are back, but this time they are in trouble. The Sigma Octanus playground has been taken over by the Covenant Babies and the Jello Lumpers ask the Spartan Babies for help. John tries to reconcile the two parties and fails. At one point everyone watches two giant Hunter Babies dance and Kelly say they look like "two Hippy Potty Masses!" Everyone breaks into riotous laughter and forgets what they are angry about. HB108 - "The Ghost in the Diaper" - Grandpa Keyes officially adopts the Master Chief and announces he is moving away. In a emotional parting sequence, the Master Chief says goodbye to the other Spartan Babies. Aunt Halsey gives the Master Chief a new armored bodysuit diaper, but after some strange incidents the Master Chief becomes convinced the diaper is haunted. During their trip, Grandpa Keyes' ship breaks down because the Covenant Babies put sugar in the gas tank. Grandpa Keyes sends the Master Chief out to find a tow truck and the Master Chief discovers that his diaper isn't haunted at all; it's just his new imaginary friend, Cortana. HB201 - "No Time! Like the Present?" - Grandpa Keyes summons the Master Chief to the bridge, but the Master Chief has other ideas and plays hide and seek with the Marine and Covenant Babies. When he finally shows up, boy is Grandpa Keyes mad! When Grandpa Keyes sees how cute and lovable the Grunt Babies are, he forgives the Master Chief and gives him a shiny new pistol! HB202 - "Look Before You Leap" - The Master Chief and Cortana set off to find out where strange groaning and banging noises are coming from, only to discover that the Covenant Babies put sugar in the Pillar of Autumn's gas tank! The Master Chief gets so mad he chases the Covenant Babies around the ship in the time-honored tradition of Scooby Doo. But the Master Chief isn't paying attention to where he's going and trips over some Marine Babies, causing all of them to be embarrassingly ejected in a lifepod. Oh no! HB203 - "Ooops, I Said it Again" - The Master Chief and Cortana find themselves on the surface of the mysterious ring named Halo. The Master Chief thinks it's a giant Hula Hoop, but Cortana says it must be a gas station. They make many friends with the Marine and Covenant Babies they encounter, however, tempers flare when the Marine Babies start saying naughty words... many, many naughty words. 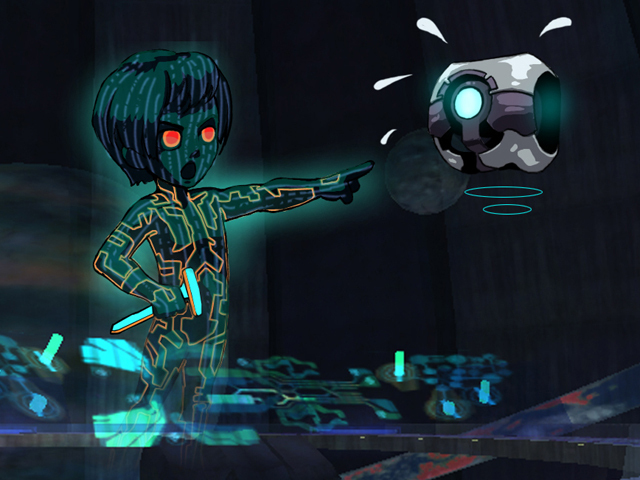 Cortana manages to get everyone to play nice after threatening to turn off the pretty beam towers. HB204 - "The Big Wheel" - The Master Chief gets a shiny brand new Big Wheels Warthog, but won't let anyone else play with it. When Cortana points out that it's big enough for three babies to play with at the same time, the Master Chief relents - but, he still insists on driving. On a more somber note, everyone is disappointed that they can't find the gas station attendant. HB205 - "Don't Look Down" - Grandpa Keyes has had one of his "spells" again and has wandered away. It's up to the Master Chief and Cortana to find him! While searching with the help of some rough-and-tumble Marine Babies, the Master Chief learns a valuable lesson about playing near cliff edges. HB206 - "Private Parts" - Still searching for Grandpa Keyes, the Master Chief uses his sniper rifle to spy on some Grunt Babies taking a poop. Cortana chides him for snooping but he does it anyway. Finally they find Grandpa Keyes onboard the Covenant Babies ship, being entertained by Elite Babies who can make themselves invisible. Turnabout is fair play, as the invisible Elite Babies catch the Master Chief with his pants down, too. HB207 - "Little Cyborg, Big Heart" - The Master Chief, Cortana, and the Marine Babies go to the beach, but the Covenant Babies are already there having a party. The Master Chief becomes a bit peevish and plays too hard with the Grunt Babies. When one of the Grunt Babies gets pushed over and starts crying, the Elite Babies intervene. The Master Chief is shamed by his behavior and sincerely apologizes. All is forgiven when the babies realize that there is plenty of beach to go around. HB208 - "The Silent Cart Ossifer" - The episode begins with the Maser Chief, Cortana, and the Marine Babies telling ghost stories. Sarge Baby tells the frightening story of the "Silent Cart Ossifer." 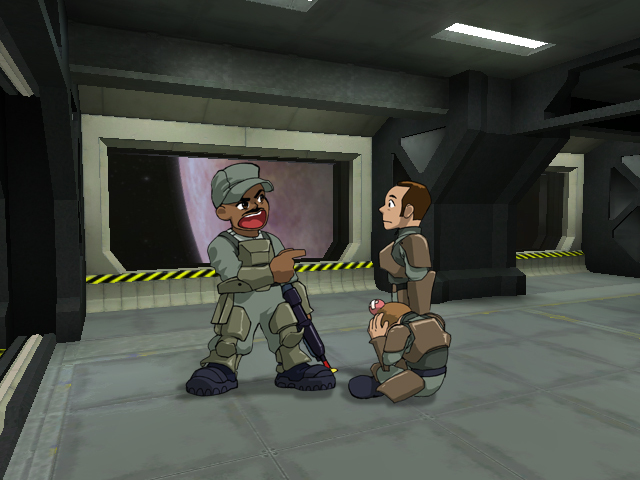 The Master Chief says it's a bunch of "warthogwash" and Sarge Baby dares him to go into the alien control center. Against Cortana's advice, the Master Chief accepts the dare and goes inside. The Master Chief's bravado quickly evaporates and is nearly scared to death by an equally frightened group of lost Covenant Babies. After much wandering the babies find the exit and the Master Chief learns that doing things on a dare can be a bad idea. HB301 - "The Big One that Got Away" - Cortana and the Master Chief continue their search for Halo's gas station attendant. Along the way they fall in with some Marine Babies who are guarding a huge Sore Pene Tank. The Master Chief has always wanted to drive one and jumps right in the drivers' seat. Cortana tries to tell the Master Chief about the big ADULTS ONLY sign, but before she can say anything the Master Chief has started the engine and is racing away! Big trouble ensures when the Master Chief realizes he's too short to reach the brake peddle. A wild and woolly adventure unfolds as the combined Marine and Covenant Babies chase the out-of-control tank over hill and under dale. Finally, the tank crashes into a building. Prompted by Cortana's browbeating, the Master Chief admits there are some things, like drinking liquor and smoking, babies should never do. HB302 - "Scratching an Itch" - With an ironic overtone of deja vu, Grandpa Keyes has wandered off again. In his haste to begin the search, the Master Chief leaves Cortana stuck in the gas station's candy machine and heads out without her. His searches take him to a hot, steamy jungle with the Marine Babies. The oppressive heat gets to the Master Chief and he declares that babies were meant to naked and free, and promptly sheds his diaper. The Marine Babies don't agree, and for good reason; the Master Chief quickly finds out that jungles are filled with mosquitoes and poison ivy. Ouch! HB303 - "You Tickle My Funnybone" - The Master Chief still searches for Grandpa Keyes and comes across a magical closet that looks like it hasn't been opened for centuries. His curiosity gets the better of him, he opens the door, and out pops... Flood Spore Babies! The Master Chief gurgles with delight as the Flood Spore Babies tickle him with their cute little sensory fronds. But all is not well as the Covenant Babies are jealous. Just as the Master Chief gets everybody laughing in a big free-for-all tickle fight, Halo's gas station attendant, Twee For Twee Giddy Spank, appears and teleports the Master Chief away! HB304 - "Truth... and Reconciliation" - Twee For Twee Giddy Spank tells the Master Chief that he would be glad to help Grandpa Keyes refuel his ship, but he needs some help turning on the old gas pumps. Twee For Twee acts very mysterious and strange, but the Master Chief doesn't notice because he's too busy playing with those rascals, the Flood Babies and his new super-cool robot friends: the Sentinel Babies. When the Master Chief and Twee For Twee get back to Cortana, she lets Twee For Twee know that fibbing about Halo's true purpose is wrong. Twee For Twee admits that Halo isn't a gas station, but just a giant Hula Hoop. HB305 - "Bang Sheep in the Sky with Dimes On" - Twee For Twee is so embarrassed that he runs off. The Master Chief and Cortana worry so they start looking for him, but no one has seen him. The Master Chief wants to ask the Elite Babies if he can borrow their neat new flying machine, the Bang Sheep, but is afraid because he remembers how he treated the others when he wouldn't let anyone play with his Big Wheels Warthog (HB204). Finally he gets up the courage to ask and the Elite Babies show him how to fly. The Master Chief learns a valuable lesson: asking nicely sure helps you get what you want. HB306 - "My Grandpa is Swelled" - The Master Chief and Cortana resume their search for Grandpa Keyes. They decide to look on the Covenant Babies' ship first. Once they get there they discover the Flood Babies are everywhere... and they are tickling everything - even the ship. Grandpa Keyes is finally found, but something horrible has happened! While he was having one of his "spells," Grandpa Keyes got into the cookie jar and ate so many cookies he swelled up like a giant balloon! The Master Chief and Cortana realize that Grandpa Keyes is the happiest he's ever been with his Covenant Baby friends and the Flood Babies there to tickle him all the time, so they decide to let him stay there and be happy. The Master Chief slips the keys to the Pillar of Autumn out of Grandpa Keyes back pocket and leaves. HB307 - "Halo Goodbye" - Back at the Pillar of Autumn, the Master Chief and Cortana start to work on cleaning the sugar out of the gas tank. But they don't get far before they run into that pesky Twee For Twee Giddy Spank up to no good again. Cortana catches him fooling around under the hood, but before she can warn him that babies shouldn't mess with the engine of a spaceship, he scampers off. Cortana and the Master Chief give up on trying to get the Pillar of Autumn working and realize the only way they are ever going to get off this mixed up crazy ring is by using one of the Lung Sored fighters. They try to get to the Lung Sored as quickly as possible but things are getting difficult because the Flood Babies are up to their tickling tricks again. Finally they make it to the Lung Sored and take off. As they look back at the ring from space, the true secret of Halo is revealed to them. Halo was not a gas station, nor a giant Hula Hoop, but was a immense piñata! As they watch, Halo breaks up into millions of sparkly pieces, spreading candy and laughter to all the good babies in the universe. HB308 - "Real Marines Don't Cry" - Those madcap, incorrigible Marine Babies are at it again when they sneak into the armory and manage to knock over every weapons rack and explosives bin in the place. Ever the wise voice of reason, Sarge Baby tells the rowdy Marine Babies that "rough-housing in the armory is a good way to lose an eye!" 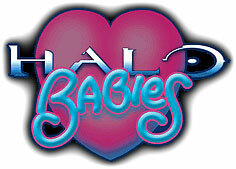 The success of Halo Babies was unprecedented on many levels. It was the highest rated children's cartoon based on a game. It was also the highest rated cartoon that lacked any commercial tie-ins. In fact, the success of Halo Babies made several media pundits question whether Microsoft should be allowed to teach morality to children. Most confusing of all is why the series has not been picked up for additional seasons. Please note: Bungie will not address Halo Babies requests via email! We are NOT Bungie, Inc.! Bungie Inc. are bungie.net!